Greetings, Skull-A-Day readers. It's my extreme pleasure to have my first post of the 4.0 year be another installment of the Super Saturday Skull Fest. Today's post is all about super skull maker Edward Przydzial. Ed describes himself as the embodiment of skulls. 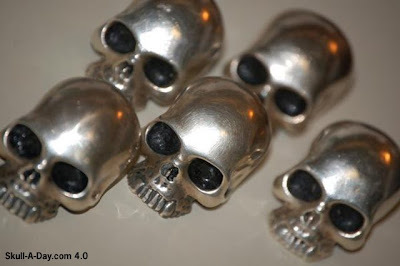 "I have been an artist all my life and my skull obsession goes back 40 years. I do tattoos, drawings, sskullptures, graphics, photoshops, props, jewelry etc. 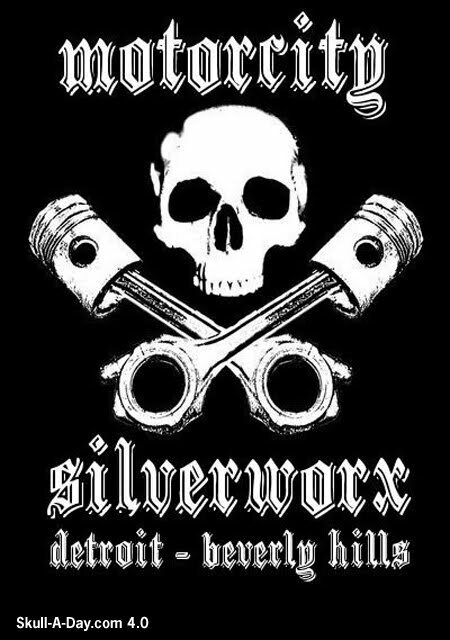 Some of my first skull arts were back when I was a kid..." These days he spends time in the Midwest and on the West coast promoting his skull business, especially as a metal smith. He even designed his own company logo. Ed makes loads of silver skulls and some of his best are these killer skull rings. Hell, even Keith Richards himself would be proud to sport one of these bad boys. I love the way they seem to devour the fingers of the wearer. Not only does his love of skulls go back 40 years, he even has family roots in the spooky entertainment industry. "My grandfather was Sir Graves Ghastly. He was a well known horror movie tv host and my love for the great monsters and horror was from the cradle." Ed's early days in entertainment were only a sign of what was yet to come. 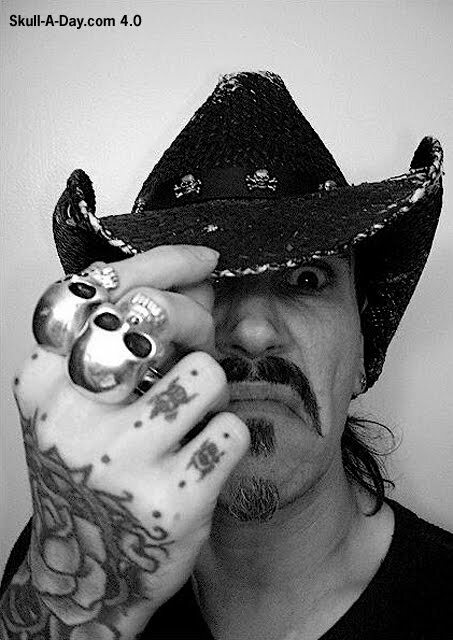 "If you dig around a bit my theatrical background goes back to the early 70's as I was also a classic Alice Cooper, mark 4 Kiss fan (Pete, Ace, Paul, etc) and my fantasy with fire, blood and skulls runs deep. I do breath fire as well." Ed keeps many irons in the fire so he is also a member of many past and current metal bands. 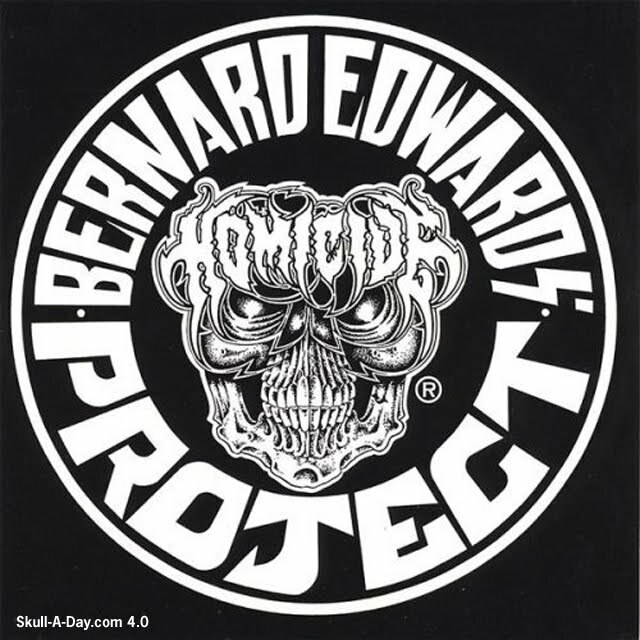 Currently he is the front man, and logo designer, of the "Bernard Edwards Project Homicide". "The music is morose, depressing doom meets thrash meets death/speed metal mixed all industrial. Undefinable in it's genre... soundscapes, neo politics and religious ideology." We tip our hat to you, Mr. Przydzial, for all of your skully accomplishments. You live your life to the fullest in the glorification of all things skull. Your inspirations come from vast and different backgrounds, and hopefully you will inspire many more people in different ways. Keep up the great work and keep it skullified! Are you a super skull artist? Do you find that most of your drawings and art projects are skull based? Then feel free to submit your pics and some background info for consideration into another Super Saturday Skull Fest. I can't guarantee that these will be done every Saturday, but if you provide enough quality material then I would love to show it off for you. Thanks! how do i get my hands on one of those awesome rings? I was wondering the same thing. My husband would love one of those rings. He did mention he was looking for a new ring.